The south side of the house has plenty of glass. This photo was taken on October 4th. In June and July, all of the south glass is completely shaded by the roof overhang. 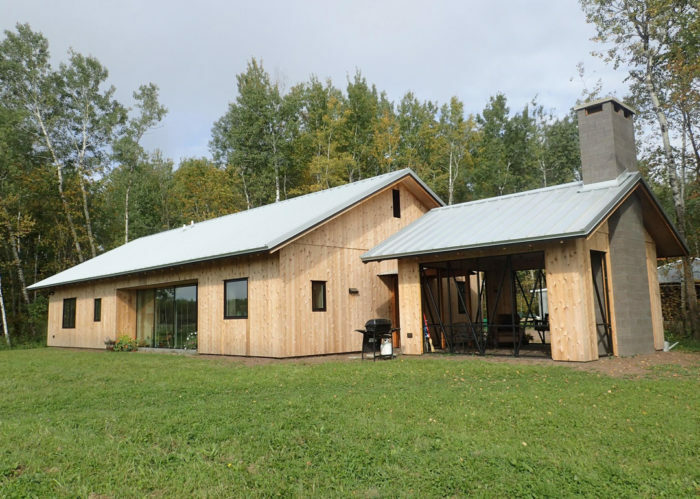 Image Credit: All images: Elden Lindamood The north (entry) side of the house. It still needs stain, but, well, you know... My favorite space is the screenless porch. I’ll work on the screens next spring. The windows have drywall returns on the jambs and head. The window stools are finished with slate tile and a simple fir apron. I built a cat box box and ventilated it via the HRV exhaust duct. It controls the odors well. 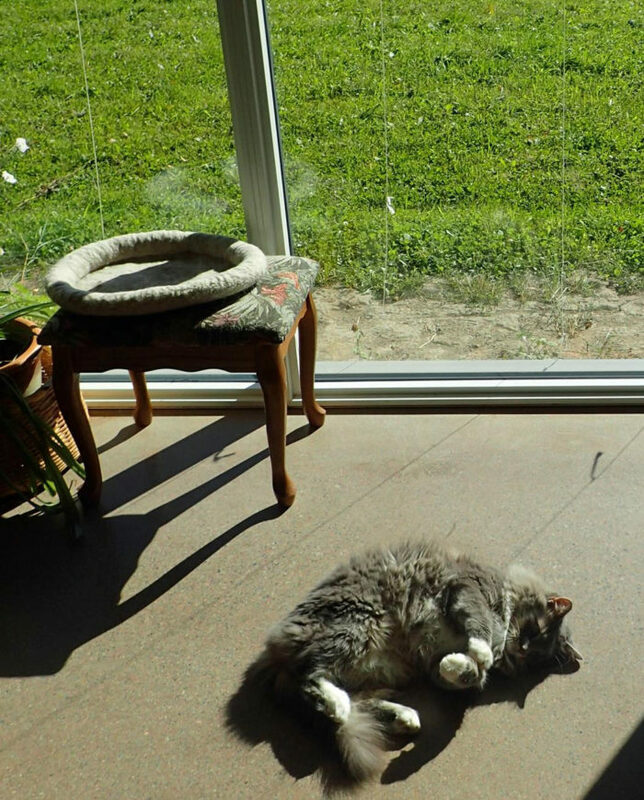 Our solar-powered cat recharging on the living room floor. 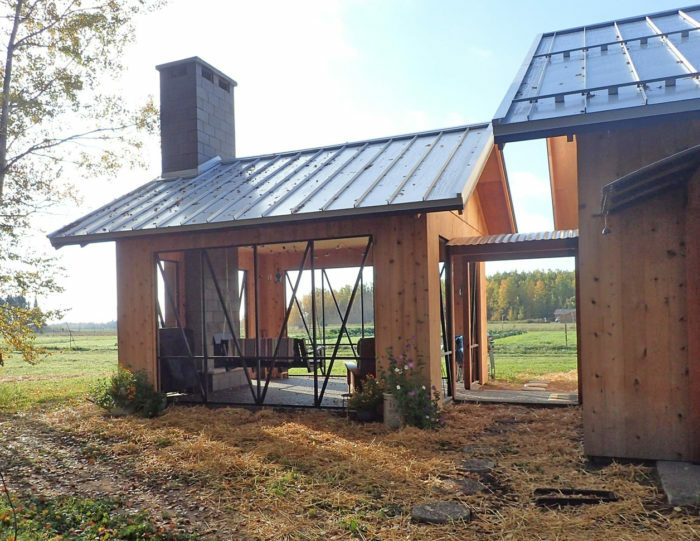 This is the fourth installment of a blog series by architect Elden Lindamood about the design and construction of his own home. 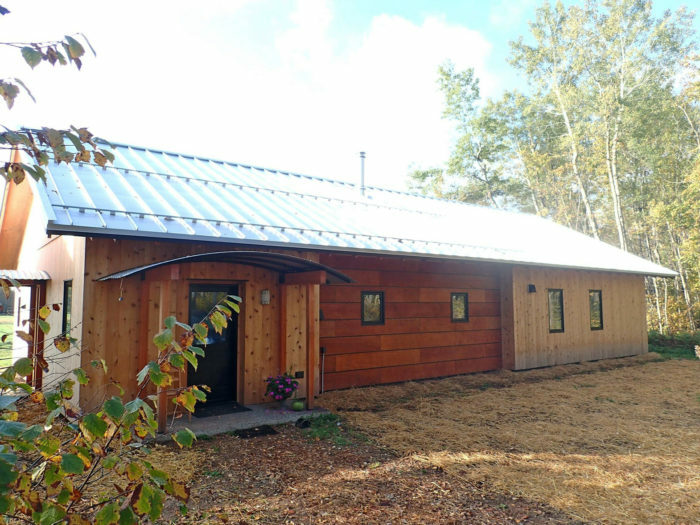 The first installment was called A Low-Energy House for Northern Minnesota. Catherine and I moved into our new mostly finished house in May. Since then I have continued to work on some details and “by-owner” items, but the house’s envelope and mechanical systems were finished prior to us moving in. There has been a bit of a learning curve, as expected, to get the dance steps right as to when to open windows, and when to switch on the air conditioning. So far it has gone fairly well, but there have been a few unexpected conditions to sort out as well. Before I delve too deeply into the details, I have a few quick observations about our new digs. Both Catherine and I are very pleased with the induction range. Thanks to all those who encouraged us to take that leap of faith. We are somewhat pleased with the condensing clothes dryer, but it has been summer and we’ve hung our clothes out to dry more than using the dryer. It is not obnoxiously loud, despite warnings. It does take about twice as long to dry things. The lint traps are fussy. Ultimately, the final jury is still out. A number of birds have bounced off our large south windows. I put up some strings to make them think twice, which seems to have helped. I may need to do something more permanent and aesthetically pleasing later. It seems that most of the common “solutions” are either ugly or don’t work. So now to the meat of it all. If you recall, our house is extremely tight: the pre-drywall blower door test result was 0.2 ach50 (58 cfm50). I haven’t yet done a “final” test, but hope to do that soon. 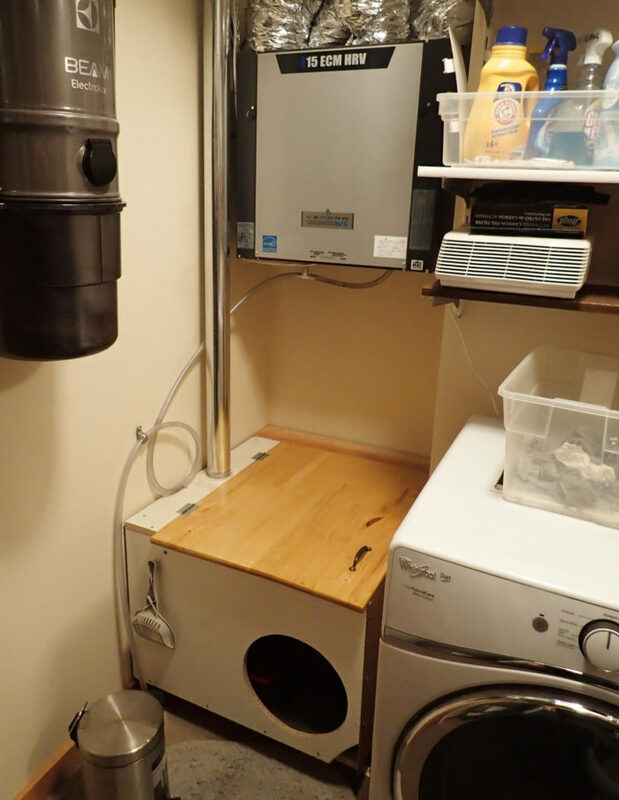 When we were balancing the HRV and adjusting the diffusers on the ducted minisplit, we did a bunch of experimentation with the HRV, the makeup air (MUA) unit, and the range hood. The range hood is rated for 125 cfm on low speed and 300 cfm on high speed. It is ducted directly through the wall out the back of the unit, so the actual airflow rates are probably close to the advertised rates. The so-called damper in the hood itself is somewhat laughable, as you can see daylight around most of the edges. It might keep a squirrel out, but cold air? Not so much. I added a second dampered hood on the exterior to improve the condition as best as I could, but even that is only mildly better. Despite that, I am very glad that we decided to go with a vented unit rather than a recirculating hood as I originally planned. We have been cooking a good bit, and being able to exhaust all that humidity from boiling down our tomatoes has been nice — assuming, of course, that I crack a window when the hood is running. 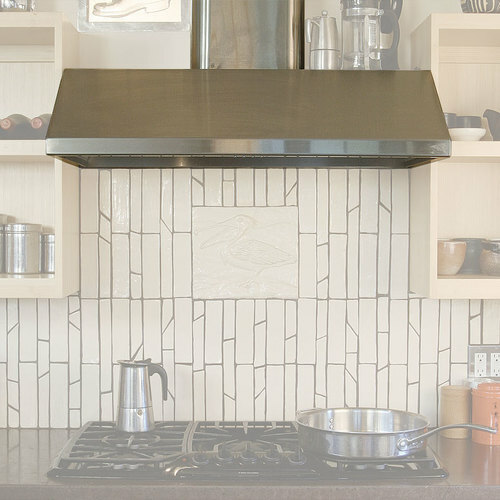 On low speed with the makeup air unit off, the range hood is starved for air. On high speed, the house is seriously depressurized. When we were running experiments, having the makeup air unit on and the range hood on low speed, the house was slightly depressurized, with the makeup air supplying about 60 cfm to the house. When the range hood kicked up to high speed with the makeup air unit unit on, the house measured 65 Pascals negative. Even with the makeup air unit on, I’ll need to crack a window if we use the range hood on high speed. 1) If the window is open, there is no reason to run the makeup air unit with the range hood. (The makeup air unit is noisy despite being in a closet.). 2) I can turn the makeup air unit on to pressurize the house when starting and/or using the wood stove, without having the range hood on. We haven’t burned any fires in the wood stove yet, but I am sure the range hood will backdraft the stove. My mechanical contractor thinks it might be okay once the stove is hot, but not having any definitive numbers for how many cfm a hot wood stove will draw — about 40 cfm seems to be the most common guess — it will have to be an experiment. 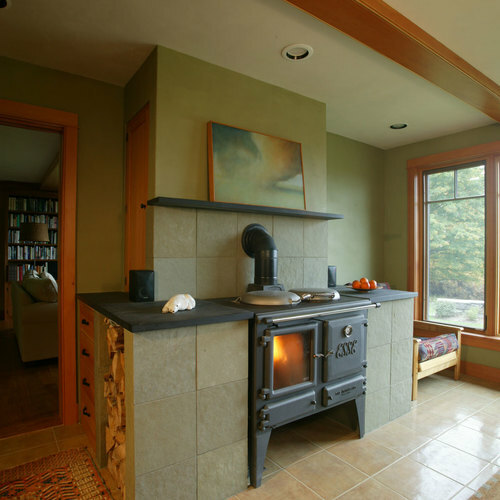 In the worst case, we’ll have to crack a window to use the range hood with the wood stove lit, but my rationalization is that the wood stove will overheat the house quickly anyway, so opening a window may not be a bad thing. Also, the stove is in plain view from the hood, so if there is a problem we’ll know it right away. I could have opted for a larger makeup air unit, but that comes with a larger electric heater, which I wanted to avoid. I’ll let you know my experiences with that in a future post. I am not overjoyed with the ducted minisplit, but not completely disappointed with it either. When it is set to cool, it runs 100% of the time. This is, of course, because it modulates down to be more efficient, only supplying what is needed to offset the internal gains. But, when you appreciate the dead quiet serenity of living in the country, it would be nice if it even occasionally shut off. I thought I could trick it into cooling too much and eventually shutting off by turning the fan all the way up, but that didn’t work. I have resigned myself to the fact that if the AC is required, the fan will always be on. We have yet to run the unit in heat mode for any length of time. Another gripe about the minisplit is Fujitsu’s poorly designed wall control. When the flip-down panel is closed, you have only three functions. 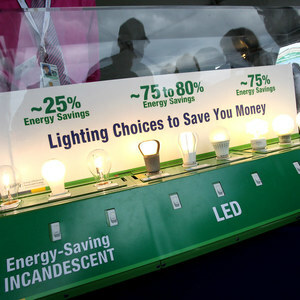 You can turn the unit on or off, and you can adjust the temperature up or down in 2 degree increments. Why only 2 degree increments? I couldn’t tell you. If you want to switch the mode between cooling and heating, or auto, you need to flip open the door where you are now presented with 13 additional buttons, eleven of which you will never use. If it was your goal to switch the mode, you better have your reading glasses and a flashlight with you, because a) the LCD is not backlit, and b) the microscopic mode symbols on the LCD are almost indistinguishable, even in good light (see photo at right). Lastly, the display tells you the set point when the units is on, but it doesn’t tell you the indoor temperature, which is annoying. And it doesn’t tell you either temperature when the unit is off. I wound up buying a large-display indoor/outdoor thermometer and mounted that right next to the Fujitsu control. It seems that in an effort to design an interface that can do everything, Fujitsu failed to design one that can do the basic functions easily. The largest issue we have experienced so far is the indoor humidity. Incidentally, a client of ours called me regarding the same issue in their new house, which is almost exactly the same construction, and close to as good on the airtightness. Neither of us put in a separate dehumidifier, as we assumed that the air conditioner would take care of the indoor humidity. That turns out not to be the case. The client reports that he hasn’t had any need to run his air conditioner for any length of time, so the dehumidification benefit of the AC is null. I have found that we run the AC more often, but still not enough to regularly keep the indoor humidity down. I am aware that there is a lot of moisture in a new house, and that the humidity will likely be lower next summer, but it has still been an immediate issue to deal with. The indoor relative humidity (RH) in the house has been consistently in the 65-75% range when the air conditioning is off. Even when the air conditioning is on, the humidity will only get to the low 60s. 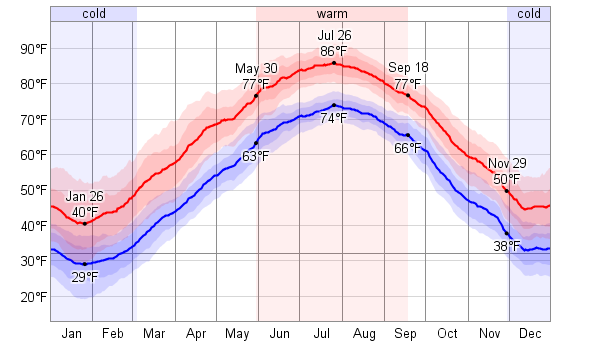 I should point out that we have had an unusually humid summer here however. That has made it difficult to air out the house at night, because the nighttime exterior humidity levels were consistently in the 95% range for weeks. The HRV wasn’t doing me any favors in this regard either, but as I said, the exterior humidity levels really were atypical, so an ERV still may not have been a better choice. I was keenly aware of this issue because of an anomaly that I can only assess anecdotally. A number of nights, when the indoor humidity was particularly high (70% or more), the smoke alarms would go off or “beep” once or twice. (Why does that always happen in the middle of the night?) This was, perhaps, the largest annoyance of the whole condition. I was thus forced to leave the air conditioning on all night, even when it was cool out, simply to try to knock the humidity down to keep the smoke alarms from triggering. It was in dealing with this that I learned that the minisplit’s “dry mode” is really just dumb. I was led to believe that the “dry mode” on the minisplit was a dehumidification mode. It is not. The “dry mode,” it seems, is actually a setting by which you can dry out the inside of the condensing unit prior to shutting the system down, lest you grow a fine Legionaries’ culture in there. It has nothing whatsoever to do with dehumidifying the interior air of the house. With this little nugget learned, I purchased a portable dehumidifier, ran a hose to the floor drain in the mechanical room, and let it run. The good news is that running the dehumidifier in the mechanical room with the door open reduced the indoor humidity of the house from above 70% to about 50% within 24 hours. It did, of course, also heat up the mechanical room really nice, which in turn necessitated turning on the air conditioning, which further dehumidified the house. I discussed “installed” dehumidification with a mechanical contractor and was told that for about $1,500 he could put a unit in that would utilize the existing ductwork of the minisplit and would be slightly more efficient than the portable unit I was running. I am not quite ready to make that investment as I am banking on future summers to be more typically dryer, and that the house’s banked construction moisture will dry out this winter. Only time and experimentation will tell, but I’ll keep you all posted. In the meantime, if I were to design a new system from scratch, I’d likely include a dehumidification system from the get-go. Those are the basic lessons learned so far. Along with working on the “to-do” tasks like staining the siding and installing screens on the screened porch (see Image #3, below), I also have purchased a TED energy usage monitor that I hope to soon install in my breaker panel to see what my different circuits are doing. This should also allow me to deduce our house’s energy use as distinct from the rest of the farm’s usage since our meter is out at the road. I’ll report on that data once it is collected. Right now, I’ve got to go install a dining room light so we can see our dinners when the days get shorter. 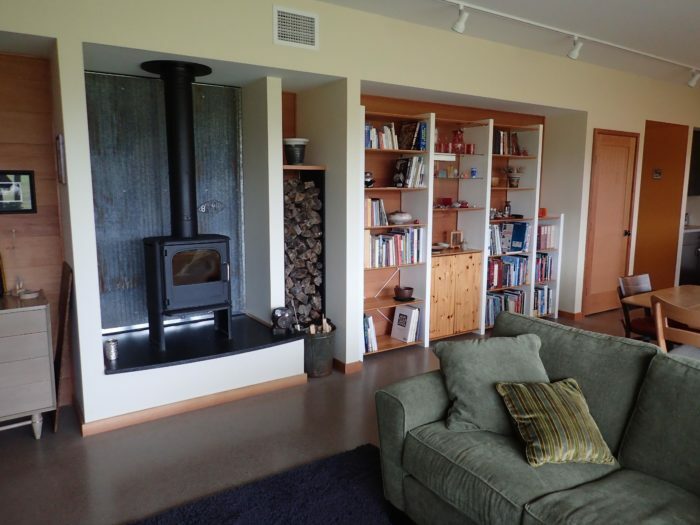 Elden Lindamood is an architect with Wagner Zaun Architecture in Duluth, Minnesota. Sounds like you all are getting to know your house. Nice house. Word on the cat barf, as you already know it's the stomach acids that are etching the concrete. Hairballs are largely diet related and opting for a "grain-free" canned or raw diet gives you the best chance to eliminate them entirely. I'm speaking from experience of course. Best of luck with the new house! How about a perimeter of stone around the house/siding, might look nice and keep dirt splash back down? We ran a small/cheap dehumidifier in our new tight house (zone 6, NH) once it was closed in and insulated (over a winter, before we moved in), was critical for getting the new house relative humidity down. I'm surprised by a couple things: that you run the AC all summer and the meaning of dry mode on the Fujitsu. We use our Mitsubishi mini split for random days or occasional weeks in the summer when it gets 85+ or too humid. And that is just in DRY mode on low fan speed, which does a nice job of dehumidifying and slight cooling, very quiet. The dry mode on the Mitsubishi is stated as "Dehumidify your room. The room may be cooled slightly. Temperature cannot be set during dry mode." It does say to run Fan mode after Cool or Dry mode to dry out the indoor unit. Anyways, the place looks great and hopefully you'll work out the (minor) issues. Chris. It amuses me that the first response was a suggestion for the cat barf issue. Thanks for the tip, I'll look into that diet. Brian, I was mainly running the AC because of the exterior humidity issues. The house would warm up to about 76 during the day, mostly from internal gains I am guessing. Normally I'd open a window and cool it off at night instead of running the AC, but since the indoor humidity was already 70% and the outdoor humidity was above 90% for weeks, I wasn't able to do that effectively. I'll look again at the "dry mode", but when I set the unit for that function, the fan didn't even come on. I read someplace that dehumidification wasn't technically its intended function in that mode. I'll see if I can dredge up that source and continue the conversation on it. I have been eagerly waiting for an update on your project, and the pictures do not disappoint. Looks like a great house. Don't sweat the cat thing. If you solve that problem they will simply think up another way of irritating you. I'm curious about the "dry" mode information. According to multiple Fujitsu manuals, there is a "coil dry" operation, but that's different from "Dry Mode", which is intended to improve dehumidification while cooling. ● Use for gently cooling while dehumidifying your room. ● You cannot heat the room during Dry mode. operate at very low speed when adjusting room humidity. The COIL DRY Operation will operate for 20 minutes after pressing the COIL DRY button and it will stop automatically. Here is where I gleaned my current information on the "dry mode". Here, they conclude that "dry mode" is basically an extremely low cooling mode, which is supposed to result in dehumidification. But if there is no cooling load, then it is pointless. They do make the distinction between the Dry Mode and the Coil Dry mode. Before coming across this, I left my unit on "dry mode" for three hours. I could not hear the fan running at all, but I suppose it is possible that it was running so slowly that I could not tell. After three hours, not a drop of condensate came out of it, despite the fact the indoor humidity level was above 70%. If it isn't condensing any moisture out of the air under those conditions, then I'd argue that it isn't really doing anything at all. Since, as you note, you can't adjust the fan speed in dry mode, I am not sure what I can do to make it work better. It certainly had zero effect on the indoor humidity during that three hours. That is why I started looking into it. I'd be curious if someone has actually had luck with the dry mode. Is it something that a wall cassette is better at than the ducted unit? If the fan isn't running it isn't dehumidifying. It's unlikely that you wouldn't be able to tell if the blower were operating, since the blower noise is one of your major objections. It never operates at the lowest "super quiet" speed when in dry mode. See the discussion on Super Quiet mode on p. En-6. Simply setting it to dry mode won't do a thing if the blower isn't running, whether it's on for three hours or three days. You have to keep bumping the setpoint down until the blower kicks on, at which point it will provide some dehumidifcation, at least until the room temperature drops below the setpoint. There will always be cooling when operating in dry mode. Dry mode maximizes the latent cooling (humidity) to sensible cooling (temperature) fraction, but it can't dehumidify without sensible cooling. It isn't a substitute for a dehumidifier, just more drying than when operating in the standard cooling mode. When the sensible load is too low your only option for further dehumidification is to use a dehumidifer. This is a common problem with low-load houses in humid climates, and it can be aggravated when there is active ventilation. The Daiken Quaternity series mini-splits can dehumidify without sensible cooling, and they dehumidify to a RH set point, but they aren't ideal for climates as cool as yours, with limited heating capacity at sub-zero temperatures. In humid summer months when the dew points are high, excessive ventilation rates can always exceed the capacity of almost any mechanical dehumidification system. The key is to keep ventilation rates low when outdoor dew points are above 55F or so (which is most of July & August in northern MN). Cooling in dry mode is going still be useful during the cooling season, even if using a dehumidifer for the latent load. Yes. Thanks Dana. I understand and agree completely. I think the issue at hand is that if you put a mode on a control, call it "dry mode", and infer in the manual that it will gently dehumidify the space, then most folks will have the expectation that if you push the button, it will dehumidfy. 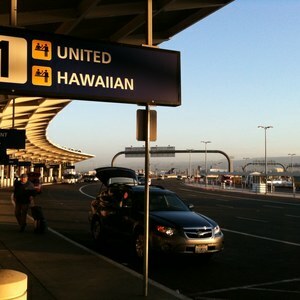 The reality is that sometimes it can't, the reasons are complicated, and the product then fails to meet expectations. I am relying on my sketchy memory, but if I recall, when the unit is set to dry mode, the interface tells me the current indoor RH, but it does not allow me to establish a set point. It simply says "this is what it is", and it is either doing its thing, or not. . I can't tell it I want it to keep going until it gets to 50% like I can on a portable dehumidifier. So I guess in the end, it isn't so much that the unit doesn't do what it says it will, but rather that it might, or might not...it depends. Fujitsu & Mitsubishi units do not dehumidify to a humidity set point. The only mini-split on the market operating that way is the Daikin Quaternity. As far as expectations, in typical code min homes dry mode would do at least an OK job of keeping relative humidity bounded, since the sensible cooling loads are high enough that it runs all the time. Virtually ALL tight high-R homes will require mechanical dehumidification other than the air conditioning system, even more so if being ventilated at a high rate. Houses like yours are 4-sigma outliers,nowhere near the middle-of-the-market for mini splits. Equipment manufacturers are not designing to serve all conditioning needs of the few houses per 100,000 with sensible loads as low as yours into one unit. It's not the sweet spot of the market. My own home isn't nearly as tight or high-R as yours, but due to PM shading factors the sensible cooling loads are very low, and mechanical dehumidification is necessary. If I had a mini-split I'd run it in dry mode, but wouldn't expect it to keep up with the latent load. As it stands, my sensible cooling loads for the whole house can be met with a half-ton window-shaker upstairs at the 1% outside design temp, but it doesn't quite keep up with the latent load. Dry mode, thermostats, fan speed. +1 to Dana re: "Dry mode". You have to set the T-stat set point to the low end of what you'll tolerate for cooling. The system will run the compressor a little harder and run the air handler a little slower in order to create the coldest possible coil without developing frost. The compressor will turn off when the set point is met (or exceeded?). Mitsubishi's dry mode controls the coil temperature to ~40F...I imagine Fujitsu does something similar, but this is one of the few areas where Mitsu's published engineering data exceeds Fujitsu's. I'm surprised at your summertime humidity levels....though if the system doesn't run, there's no possibility to remove the moisture. What size system did you install and what's the total system airflow in cooling mode? 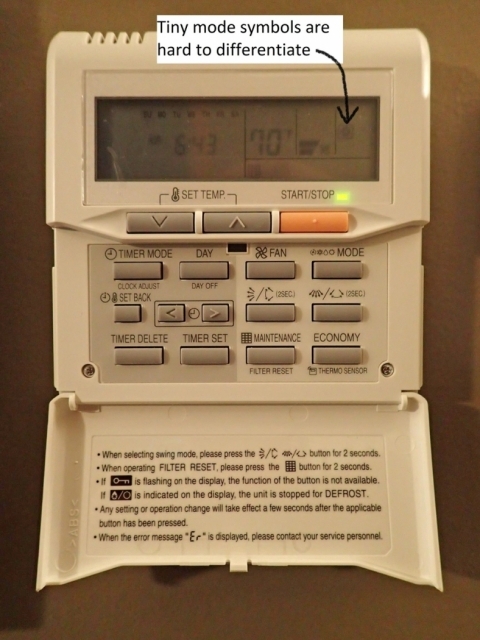 It could be that you need to change the fan speed setting in the installer's functions settings on the T-stat....or just run the system in dry mode at 74F or 72F all summer. FYI - the default on these systems is for the air handler fan to run 24/7...even if the compressor is off. That is, if you're in cooling mode or heating mode, the air handler fan will be on. When the compressor is off, the air handler fan will run in the "Super Quiet" mode....which at my house is 100% undetectable unless I put my hand up to a register....or look at my power meter - a whopping 8 Watts! Excellent point Dana, that I am technically using the system outside if its expected design parameters. I shouldn't fault their engineers for failing to meet my expectations when I am operating outside of theirs. John, I installed a 12RLF. 12Kbtu nominal cooling, 16Kbtu nominal heating. I don't recall what the commissioned air flow was at the coil. I am also trying to recall the conditions under which I was trying to get the unit to dehumidify. It is likely that it was only 70 or 72 degrees in the house, which would explain why it did no good. I do seem to recall, however, that I didn't have the option to change the temperature set point when the system was in dry mode either. I feel like it defaulted to 70, and that was it. Thanks for confirming that the default is fan on 24/7. I can definitely hear it running (that is I can hear air flow, not the fan motor), but as mentioned it is DEAD quiet at our house when the thing is off (assuming the fridge isn't running either). I see if that setting can be changed. Otherwise I might just have to turn it on/off manually more often if I want the silence. I really appreciate all this feedback. I'll definitely have to continue to mess with it, and pay more attention to the environmental conditions at the time. 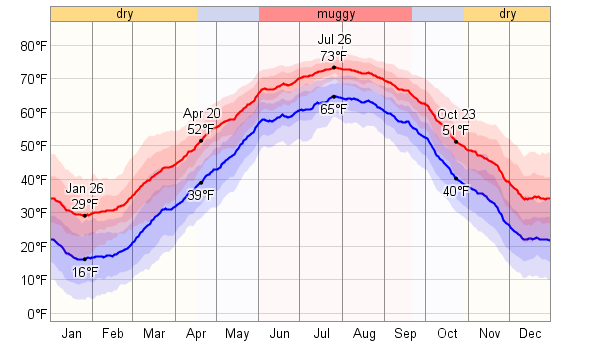 It will likely be a while now in Minnesota before I experience a high humidity cooling demand again though. Nice House, enjoyed your post, most people don,t get into the ventilation details. You may want to change from relative humidity to dew point when comparing moisture content in the air at different temperatures. For example if I assume your indoor temperature is 75 degrees and relative humidity is 70% the dew point is 64.5 degrees. At 95% relative humidity and a dew point of 64.5 or less the outside temperature would only have to be less than 66 degrees to have less moisture content or be dryer. Hope this helps. Hi Elden, nice house. I also have a Fujitsu minisplit, but so far it has done a great job controlling humidity during the summer seasons. I live in a passive house in Virginia where humidity is a major problem during summer. We keep the wall control exclusively in dry mode all summer long and have been getting excellent indoor humidity and temperature control. 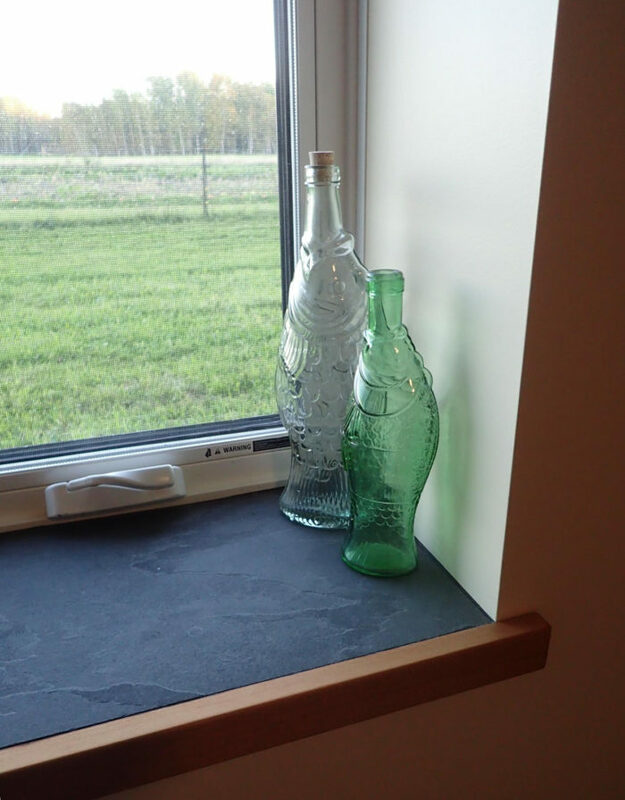 It has been maintaining indoor humidity between 40% and 50% and temperature max at 78F. When we tried A/C mode we found that indoor humidity could get pretty high and indoor comfort was not as good especially when the unit wasn't running much. FYI, when the unit decides to turn on the noise/sound level is the same whether its in dry mode or A/C mode. I was sorry to hear that you were having trouble with your minisplit in dry mode, so I thought that I'd at least let you know my experience. It was a bit of relief to see that I'm not the only one who hates the Fujitsu wall control. When I mentioned to my wife that John Semmelhack posted a link to an upgrade she immediately responded "Get it". I am so relieved to see your post about the humidity issue with your ducted mini-split in your energy efficient home. 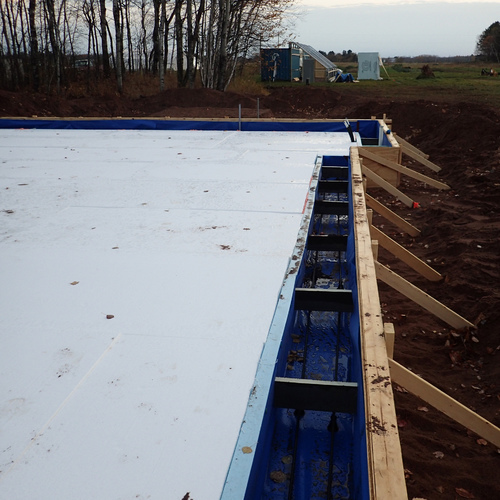 We built an ICF home and use the Mitsubishi mini split with an ERV. We have had major issues with humidity here... around 70% in the summer and down to 25% in the winter. As you can imagine, this has been awful for our moulding and even the caulk in the tile bathrooms. Initially my mini-split was not set up to allow for the drying mode... I think the people that installed the system were not familiar enough with mini-splits. I had another HVAC company come out to look and they made it so that I could use the drying option, but it did not change the humidity at all, unfortunately. I ran space dehumidifiers this summer and it was ridiculously expensive and inefficient, so I am now looking at a $7000+ fix to get a ducted Honeywell dehumidifier put into my attic space to try to fix the problem on the second floor, where it seems worse. Any thoughts on proceeding with this route? Thanks for your insight! It's probably the ventilation rate. Concrete construction has a lot of initial moisture content that often takes more than a year to stabilize. But if your interior RH hits 70% @ 75F (= dew point of about 65F) in summer even when there is a real air conditioning load, the culprit is most likely to be high ventilation rates. Most of the eastern half of the US has outdoor dew points that average in the mid-60s during the peak months. While an ERV can reduces the latent load by a modest fraction, it doesn't dehumidify, it only exchanges moisture between the incoming and outgoing air streams. Mechanical dehumidification is always necessary when there isn't a significant sensible cooling load to keep the air conditioning running a decent duty-cycle. Having higher humidity on the second floor or attic is sometimes related to using open cell foam on the underside of the roof deck without vapor retarders. Could this be you? If it's a vented attic in a humid climate, there could also be air leakage at the ceiling plane, sometimes driven by air handlers and unbalanced duct systems. 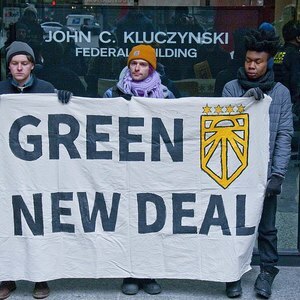 Climate matters. Got a ZIP code? Kirsten: don't spend $7000 until you know where the moisture is coming from. Did you ever have a blower door test done? I do have spray foam inside my attic... and I am guessing it is probably open cell foam without vapor retarders. I am trying to find the documentation to say for sure... but considering that I was going for zero VOC's, my guess is that it does not have vapor retarders. As for the blower door question... I did have this done to get my certification. However, I have not had it done since then. It sounds like this could help identify the source of the humidity? What were your blower door numbers? And, what is your ventilation rate? Ideally you would back off on the ventilation rates whenever the outdoor dew points are above 55F (50%RH @ 75F), which gives the air conditioning & mechanical dehumidification a chance to keep up. That's roughly from half-past May through the end of September in your neighborhood. I have tried the ventilation rate at all different levels... both increasing it and also turning it off or down to 10%. Neither seemed to make a difference. I contacted the person who helped me with LEED certification and she said that I did not do the vapor retarders because it was not on the radar at that time. She said the blower door numbers were really low (didn't remember the exact number without looking up my paperwork) because the house is so tight, but she expected it was less than 3ACH50. If I have the ERV system on 10% (the lowest it will go), the drying mode for the mini-split, and I retroactively get the vapor barrier, do you think I could solve the issue? I assume it's possible to do the vapor barrier now? In winter (any time that your heating system is operating), ventilation will tend to lower your indoor humidity levels. In summer, especially when the outdoor dew point is above 55 degrees F, you want to minimize your ventilation rate. I don't know what the "10%" setting on your ERV means, but if I were you, I would try no ventilation at all during the summer, coupled with a stand-alone dehumidifier, until your indoor RH is under control. During the heating season it's reasonable to run the ventilation under dehumidistat control, holding the line at 35% on the high side, shooting for a comfortable 30-35% RH range. As several people have advised you, it's worth figuring out why your indoor relative humidity is unusually high. There are lots of possible sources of moisture. For more information on the type of detective work required to solve your problem, see Preventing Water Entry Into a Home. Thank you, Martin and Dana. 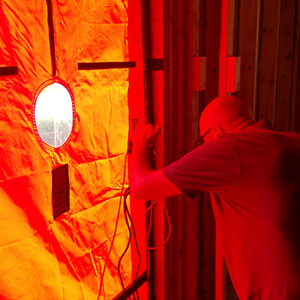 I'll give it all a try... what are your thoughts on retroactively applying the vapor barrier? Q. "What are your thoughts on retroactively applying the vapor barrier?" A. Your question confused me, but then I re-read your previous comments, and I found this: "I do have spray foam inside my attic, and I am guessing it is probably open-cell foam without vapor retarders. I am trying to find the documentation to say for sure, but considering that I was going for zero VOCs, my guess is that it does not have vapor retarders." You can't apply a vapor-retarder paint to open-cell spray foam. (Actually, you can -- but it won't work.) If you are thinking of using vapor-retarder paint, you have to install drywall first, and then install the paint over the drywall. There are lots of issues here. If you want to learn more about humid attics insulated with open-cell spray foam, read this article: High Humidity in Unvented Conditioned Attics. Sorry... I fell off from this discussion because I don't get notifications of responses and then I was sidetracked! I am coming back to it as it's now winter, and again, I experience major cracking where my drywall meets between wall and ceiling on the second floor. I have had this repaired multiple times, only for it to occur again each winter. Last year, I had crown moulding put in upstairs to cover it and, despite two attempts at using "very flexible" caulk, and two portable humidifiers, I am getting cracks already! As soon as my house goes below 45% humidity for any period of time the cracks seem to reappear. Martin, I saw that I can not retroactively add the vapor barrier, which I was hopping would be key! That is so disappointing. Of note, the attic is not conditioned... it's just covered in spray foam on the interior. I have the ERV on 10% again, just because I would like some ventilation. I'm guessing that the workers who framed your house didn't realize that they weren't supposed to nail the top plates of partition walls to the bottom chords of the roof trusses. As this point, crown molding may be a good solution. Oh wow. That does, in fact, sound accurate and you are the first and only person to be able to pinpoint this. I had the drywall people out, painter, consulted the architect and the contractor. But, this makes the most sense... Unfortunately, my crown moulding still hasn't solved the problem. That almost sounds like I need them to redo the drywall completely on my ceiling and walls to solve the problem permanently since the crown moulding didn't work??? It's sad to think that you consulted four professionals -- a drywall contractor, a painter, an architect, and a contractor -- and none of them has ever heard of truss uplift. If you have attic access, and you are able to move the insulation aside temporarily, you may be able to get a Sawzall in there and cut the nails holding the top plates to the truss chord. I've never tried this, though. If you can do that, you could try to retrofit some sliding clips to hold the top plate in place. Not an easy job. Other GBA readers may have other suggestions. Well, none of them mentioned this as a possibility, that is for sure. I just spoke with another friend in the business and he had not heard of truss uplift either. Thanks for your feedback... I'll let you know if I end up having any success and/or gratification. I will also ask my architect and contractor if they recall how the trusses were attached! Unfortunately, if it is truss uplift, which it sure sounds like, the cracks will still reoccur even if you manage to separate the trusses and walls, because the drywall needs to have no fasteners within 12" to 16 " from the corners. If the builder didn't know about truss uplift when framing, they probably didn't know how to avoid it at the drywall boarding stage either. Thanks again for the insight, however depressing it is. I am actually more relieved to not be banging my head against the humidity issue anymore and realize it's something different all together (although still influenced by humidity). The codes may only recently have changed, but the drawings and installation instructions that accompany truss deliveries have had specific instructions for avoiding truss uplift for at least the last thirty years. There a a few remedial things you can do. Some are quite involved. it depends on how much it bothers you how far you pursue this. Not every dispute can be litigated, of course -- nor should it be. But there is no excuse for your architect and framers not having heard of truss uplift, or not knowing how to prevent this kind of drywall cracking -- whether they framed your house 4 years ago, or 20 years ago. Thank you both so much for your insight. I am headed out of town for a week, but my architect is going to help me find someone to evaluate upon my return. I'll keep you posted, if you are curious! The cracks occur as the trusses move seasonally and leave a gap between their bottom chords and the top plates of your interior walls. Fastening the trusses to the walls would actually go some way to mitigating the cracking, but can cause the walls to lift along with the trusses - as you can imagine this can create a wide range of other problems. 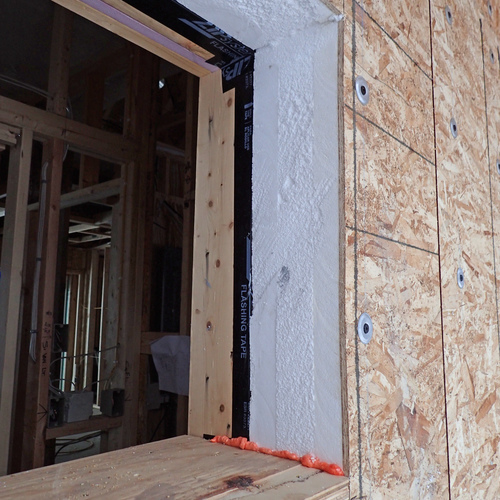 The solution is to keep drywall fasteners back from the intersection of walls and ceilings allowing the corners some flexibility to move without cracking. Good luck resolving this, and yes I would appreciate any updates. We have found the Bird Safe window strike decals to be effective and not very distracting. Were you able to route the HRV ducts without ceiling penetration ? So many challenges designing a single story, slab on grade house. Yes, all of the HRV ducting and the mini-split ducting are within the conditioned envelope. The house has a framed 9' ceiling, but the hall ceiling is at 8' to accommodate those duct runs heading west, and there is a duct chase running east that creates the recessed areas in the living room. The attached photo shows the living room soffit (if I can do that correctly). That inconspicuously gets my supply to the entry, and an HRV return near the kitchen at the far east end of the house. I also dropped the ceiling in the main bath toilet compartment to get to the shower room. The ducts in the mechanical room are exposed at the ceiling. Is the truss a vaulted ceiling ? or a flat ceiling? A vaulted ceiling truss will deflect under load a lot more than a flat ceiling truss will. Another feature of the required gap between the top plate and the bottom chord of the truss is incidental loading of the bottom chord in bending due to the roof loads. The gap and the truss clip allow the entire truss to deflect under load. This gap and truss clip requirement has been around for a long long time. A possible solution to suggest to the architect is to modify the truss by add a diagonal (or two) into the truss. It would go from the top chord connection node in plane to over the bottom chord at the wall. This would keep the bottom chord from moving. This needs analysis of the truss and load path down the building from an engineer to implement.